"This is what we are. The endless struggle laid bare. Gone is the idyllic, the deceit of self-import as well as the false humility of insignificance. Even as we battle wholly personal battles, we are unified. This is the place of level earth, Corporal." I read this book immediately after Gardens of the Moon, the first book in this series. (See my review here.) I have almost exactly the same gripes and compliments for the second book as I had for the first. I don't think I "get" the magic in this series. Actually, I'm giving myself way too much credit. The magic is only one of many, many things I do not "get" in this series. I have trouble, with so many characters, keeping track of who is on what side of this war. And the very Greco-Roman epic way Erikson has of involving gods everywhere also causes me confusion. It's quite possible that I'm just really easily confused. In fact, that's probably what it is. Because there is a huge fanbase for the Malazan books (check out The Malazan Empire). And none of those fans seem to have any trouble at all following what's going on! I don't mean to imply in any way that Erikson's work is not absolutely awe-inspiring in its breadth and depth. At a projected ten books all of doorstopper length, he must have an absolutely amazing imagination. And an even more envious method of organization. 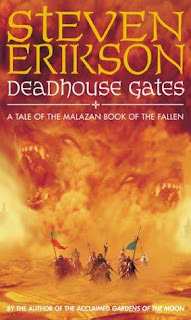 From what I understand, Erikson has three main arcs to his epic- the first one was introduced in Gardens of the Moon, the second one in Deadhouse Gates, and the third one is introduced in the fifth volume of the series (not yet released in the United States), Midnight Tides. The books do not, therefore, follow a linear sequence. Deadhouse Gates and its sequel, Memories of Ice, take place at the same time. Midnight Tides- the fifth book of the series- hearkens back in time to, I believe, before Gardens of the Moon even begins. Deadhouse Gates features some of the characters from Gardens of the Moon, but not all. Those that aren't in this book, though, are certain to be in the next one. As I stated in my review of Gardens of the Moon, it takes me a lot of time and effort to get into these books. Again, the first half of this book was a struggle for me. I don't generally like following war parties through deserts, and that happened a lot. Also, it took me a while to grasp hold of an entirely new cast of characters. Really, if Erikson's books read for me the way the last 200 pages of his books read, then I think I'd be a drooling fan of his work as much as anyone else. Several people told me that Deadhouse Gates ends brilliantly- that it is breath-taking and heart-wrenching. So, of course, I struggled through about 400 pages of text to get to the end. And it really *was* breath-taking. Heart-wrenching. Brilliant. But really- why didn't I feel gripped to that extent for the preceding 400 pages? I do believe getting to the end was worthwhile. I am certain that I will continue with this series for at least one more book (after all, it's already on my shelf). I think that I am becoming very invested in the lives of these characters, and that I'm really starting to care about the people and the world they live in. I continue to hope that I will eventually understand exactly what a "warren" of magic is. And I am, really, quite in awe of Erikson's ability to write, and to write well. There were many quotes in this book that I noted down, and it was difficult for me to choose one for this blog. I don't know what I think of comparisons to George R. R. Martin right now. The two authors write in very different veins. Martin writes a great deal about his characters, and their actions and how those affect the world they live in. I think Erikson is much more wrapped up in his world itself- it is the most powerful and dominant character in the work (though he has dozens of other characters vying for reader attention). So for those fantasy fans who enjoy world-building on a grand, epic scale- I would recommend this book. And for those who find it difficult to struggle through a book that dumps them into a world they can't quite understand- you might still try the first book, and see how it goes.